Soaring high above the Quwwatual Islam mosque is the tower Sultan Qutbuddin Aibak built in AD 1196 to celebrate the invincibility of Islam. Although modelled as a classical minaror tower from which the muezzin calls the faithful to prayers, the Qutb Minar was a symbolic rather than a functional structure. It would be an extraordinary muezzin who would expect to be heard from a height of 72.5 meters - assuming, in the first place, that he managed to trudge up the 379 steps five times, each day. Qutab Minar points up to heaven on the southern side of the city. It was built in the 12th century, and it still towers high above its surroundings. When the cab driver drops you off at the gate, you are directly approached by several persons trying to sell you anything from postcards to a nice embrace with an enormous snake. 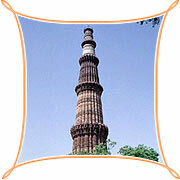 As you escape them, and after paying the entrance fee, you enter the area that houses the Qutab Minar. Not only that, it is also to several buildings, although most of them are in ruins now. You can see the first mosque of India, right at the feet of the Qutab Minar. It was built using building material from Hindu temples. Although many parts of the mosque are missing or in bad shape, you can still see marvellously sculpted ceilings, columns, and capitals. In the central square, there is an iron pillar, unfortunately closed by a low fence. Unfortunately because, as was the tradition, anyone who could encircle the iron pillar with his arms, while standing with his back to it, would have his wishes fulfilled. The Iron Pillar : The inscription records that the pillar was set up as a standard or dhvaja of god Vishnu on the hill known as 'Vishnupada', in the memory of a mighty king, named 'Chandra', who is now regarded as identical with Chandragupta II (375-413) of the imperial Gupta dynasty. A deep hole on the top of the pillar indicates that an additional member, perhaps an image of 'Garuda', was fitted into it to answer to its description as a standard of Vishnu. Quwwatu'l-Islam Masjid : Just adjacent to the tower is the mosque of Quwwatu'l-Islam Masjid, which can become a bewildering experience for those who are not familiar with its history. It was supposed to have been built using the materials and masonry of the remains of Hindu Temples and architecture. The mosque was started in 1192 by Qutub-ud-din Aibak, the first ruler of the Slave Dynasty and was finished four years later. Alai Minar : The ambitious rubble Alai Minar was started by Alauddin Khalji but the sultan lived to see it only to the height of 24.5m and no body was ready to complete his over-ambitious project. It was built to match the enlarged Quwwatu'l-Islam Masjid. Today it is used more like an illustration, by parents, that when you get over ambitious, the plans remain unfinished.